The first San Diego Children’s Theater summertime drama workshops were organized under the auspices of the City of San Diego Recreation Department by an advisory board of civic leaders and arts professionals. As most buildings in Balboa Park were still in use by the Navy, Roosevelt Junior High School was used for classes and rehearsals. The Children’s Theater program was directed by sisters Lois Masterson De Lannoy and Beth Masterson. Written by Warren Beck, False Pretenses was performed by sixth grade students. A group of grade-school boys decide they need some new baseball gloves, but don't have enough money. They trick their girl schoolmates into loaning them the money, on the false pretenses of big guy “Red” being deathly ill. See what happens when the girls find out! 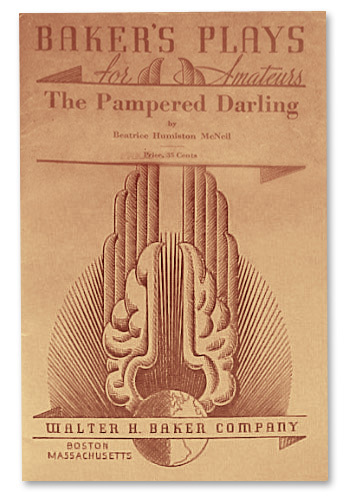 The Pampered Darling, written by Beatrice Humiston McNeil, was performed by junior high school students of the program. Presented through special arrangement with Baker’s Plays for Amateurs, Walter H. Baker, Boston. Productions sponsored in part by City of San Diego Recreation Department, and the City of San Diego.